The Eisendrath Years: Art Inspiring Music, an event co-organized by the Department of Music here at Washington University, featured original musical compositions by Wash U undergraduates. It all started as a pipe dream of my colleague, Kim Broker, associate registrar for collections, about two years ago. “What if music students composed pieces based on artworks in the collection and then the pieces would be performed at the Museum?” she mused. I liked the idea and shelved it, so it wasn’t until I met Jennifer Gartley, manager of public outreach/applied music program, last August that the idea began to transition to reality. 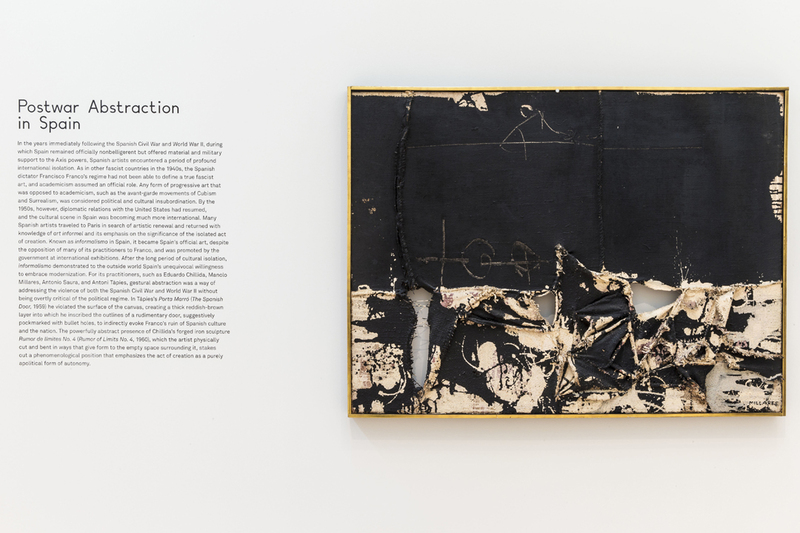 The event, which drew inspiration from the exhibition From Picasso to Fontana—Collecting Modern and Postwar Art in the Eisendrath Years, 1960-68, took place on April 9, 2015. Chris Stark, assistant professor of music, guided his composition students through the process of creating a piece of music and working with the professional musicians of the Perseid String Quartet. Below you will find the recordings and students’ descriptions of their original compositions. Left: Alberto Burri, Gran Ferro M3, 1959. 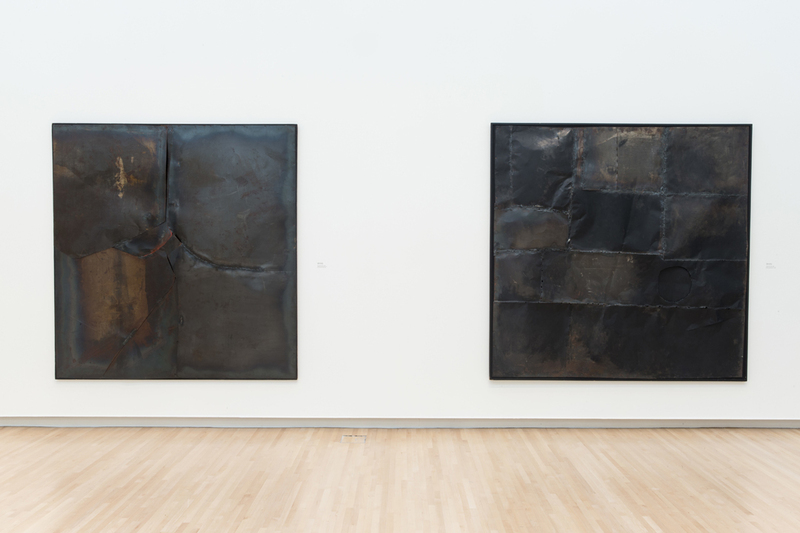 Right: Alberto Burri, Gran Ferro M1, 1958. Photo by Whitney Curtis. As a response to Grande Ferro, this piece, Ferro Sonoro seeks to give sound to the piece of metal welded by Alberto Burri. The main melody of the piece, a driving, skipping line the repeats in different guises through the piece, was inspired by the sounds of a contact mic attached to various metal objects such as a water canteen and the leg of an office chair. The volume data from these recordings was then mapped onto the pitch of this principle melody and then spread out between all four instruments. The rest of the piece was generated by applying different rules to the melody, such as stretching one instrument’s part, building chords around one instrument’s melody, or playing the melody in a cannon. The string performance of this piece was accompanied by the original sound recordings that inspired it. 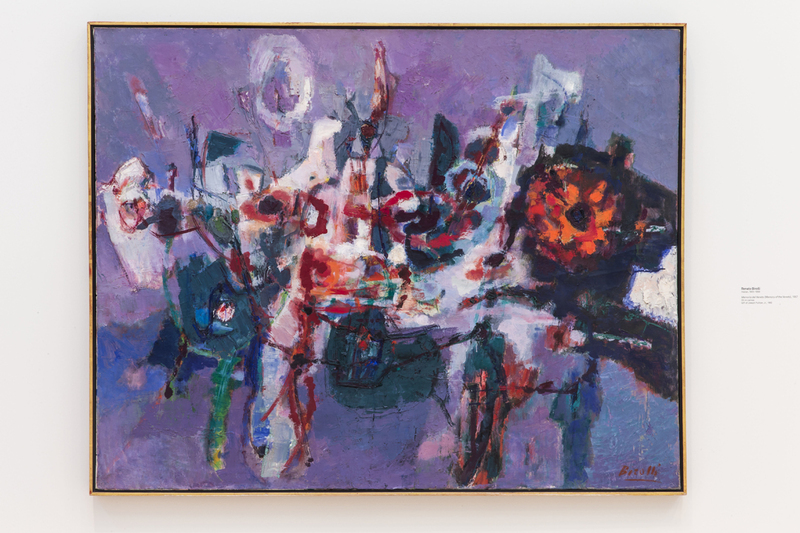 Manuel Rivera, Metamorfosis (Presencia), 1960. Photo by Whitney Curtis. When observing Manuel Rivera’s Metamorfosis (Presencia), I was struck by the variation in density achieved with such simple materials. At first, I perceived a progression from sparsity to density—a convergence from the four corners of the frame towards its center, like an increasingly tangled spider web. But my attention was soon drawn to the open space within the work, as well as how that space changes with one’s angle of observation. 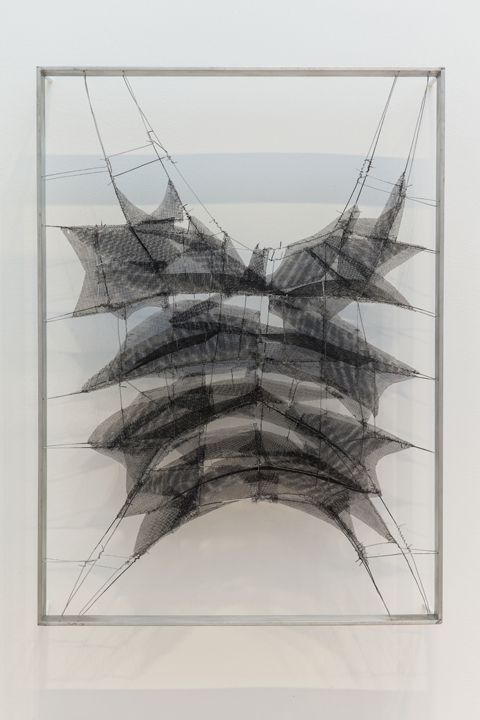 Considering the idea that the same material can appear radically different with a change in perspective—as well as how memories fade, resurface, and transform with time—I based in memory on a repeated line which weaves through the entire piece. Each time this line recurs, it is transformed in some way; while the pitch content remains the same, the line is perceptively different in each variation. Manolo Millares, Cuadro No. 82, 1960. Photo by Whitney Curtis. The work I selected by Manolo Millares was made in the context of a post-war Spain. The darkness and ripping at the bottom of the canvas conveyed to me the death and destruction of the war and I wanted to represent that in the composition I made in response. Although I read the painting from top to bottom, my piece begins with screeching and chaos that alludes to the lower part of the painting. I did this to follow the events that I interpreted from the painting chronologically, so my piece begins with my response to the bottom third of the painting, or WWII. The second part of my piece alludes to the top two thirds of the image that I interpreted as the post-war period. Although the top two thirds of the painting are dark, they are less torn and scratched so I got from it a sense of calm and relief with occasional hiccups. As my piece transitioned to a “calmer” section, I wanted to maintain the dissonant and disturbing sound from the beginning. Renato Birolli, Memory of the Veneto (Memoria del Veneto), 1957. Photo by Whitney Curtis. My name is Preston Lam, and I am a first-year WashU composer! I wrote this piece in response to Renato Birolli’s painting, Memory of the Veneto. When I looked at the painting, I saw a city’s skyline reflected over the water, like a romanticized picture of San Francisco. I was drawn to its quirky shapes, clashing yet subtle colors, and lavender-infused background. The painting made me think about how beautiful and contrasting an urban environment could be: chaotic yet structured, calm yet vibrant, grey yet colorful. These contrasting personalities, depicted in Birolli’s painting, inspired me to write my piece by imagining a pleasant journey into a city, finding new and different things at every turn. 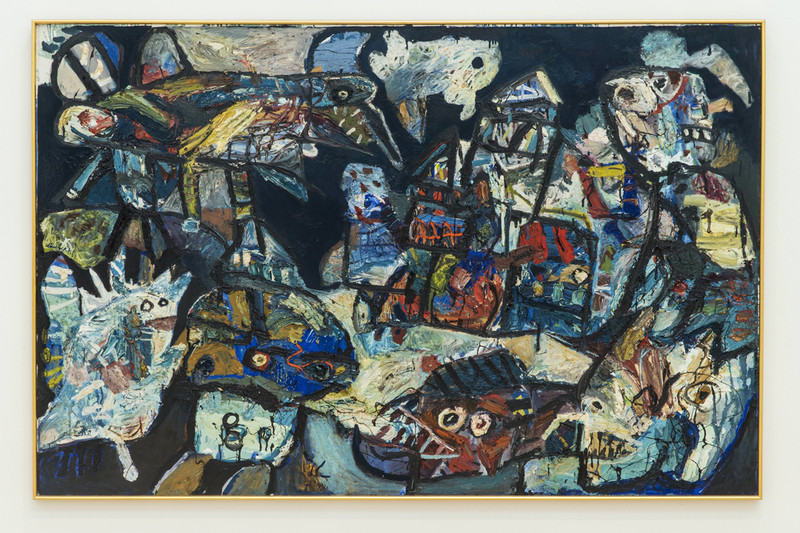 Lucebert, The Menaced House, 1962. Photo by Whitney Curtis. Lucebert’s The Menaced House depicts a distorted house surrounded by a panoply of amusing yet disturbing monsters. These beasts are mostly smiling, and some even seem cute, but the title of the painting and the presence of some more insidious monsters suggests a darker interpretation. My string quartet begins with a stable section, representing the house in its original form, built on a chord from the natural overtone series. This idea, a slow harmonic statement followed by a rustling rhythmic loop, becomes a sort of ritornello for the piece. Three episodes represent various monsters with different harmonic techniques. The first episode explores subtones, the second features counterpoint based on four different scales, and the third directly distorts the harmony of the ritornello, culminating in a noisy passage. This last episode refers to the right edge of the painting, where a witch-like creature hides: at first we do not notice her, then we realized she is so close she is part of the house itself. Zao Wou-Ki, Untitled, 1960. Photo by Whitney Curtis. 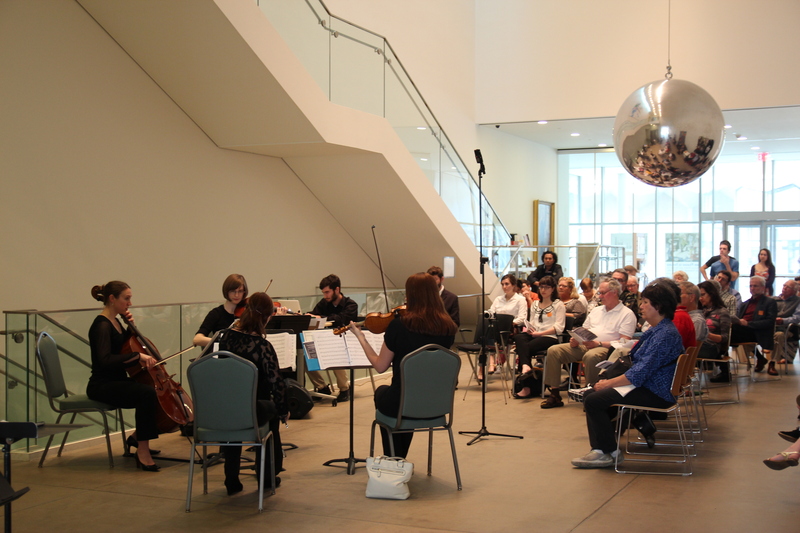 Nexus is a string quartet based on an untitled work by Zao Wou-Ki currently on display. Like the heavy contrast between yellows and blacks, Nexus juxtaposes heavy, thick musical textures with the more melodic, loosely defined in clear segments. And though the segments are well-defined, elements of the contrasting sections seem to bleed into each other like colors as the piece continues. 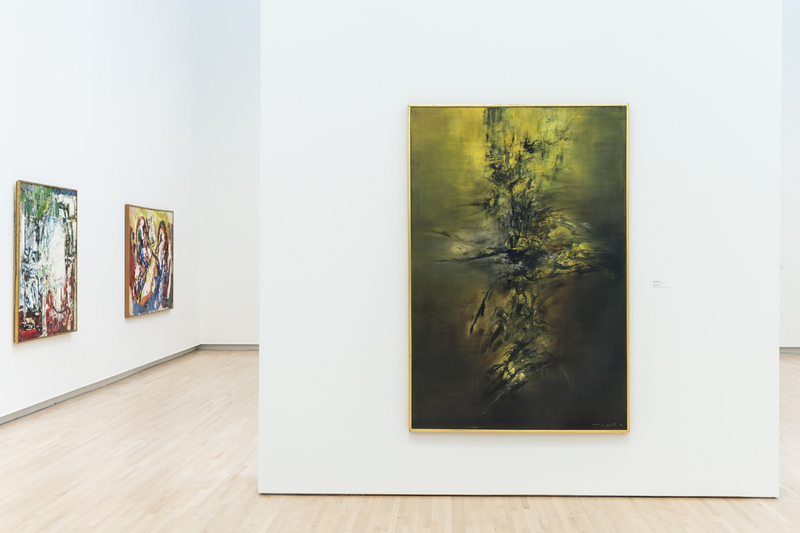 By the end, the piece becomes a swirling mass of motives, the nexus of ideas presented in the piece like the seeming dense nexus of color and brushstrokes at the center of Zao Wou-Ki’s painting. 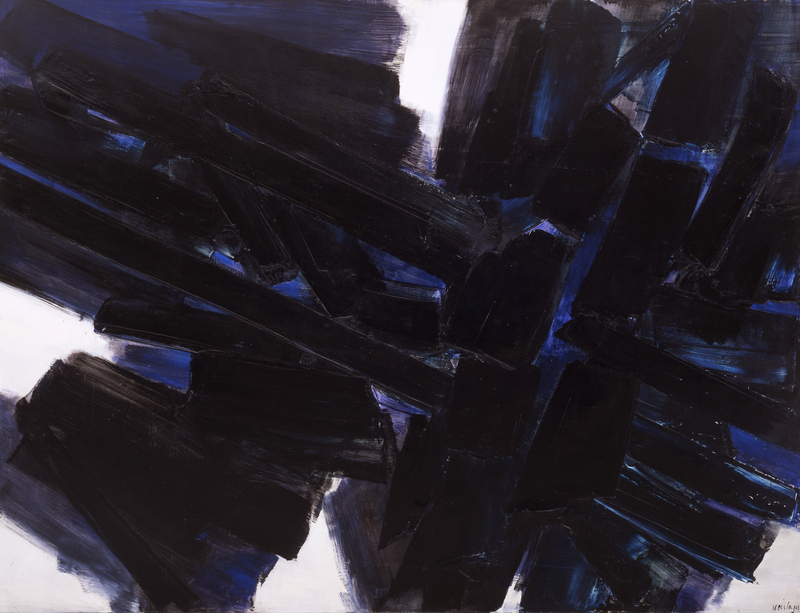 Pierre Soulages, Peinture 200 x 265 cm, 20 mai 1959 (Painting 200 x 265 cm, 20 May 1959), May 20, 1959.
quatour à cordes 5’15”, 24 mars 2015 was written for the work Peinture 200 x 265 cm, 20 mai 1959 by Pierre Soulages. Responding to the traumatic events of the Second World War, Soulages’ painting resists narrative, focusing instead on the physicality of process and the muteness of form to evoke a paradoxical sense of both presence and absence. In the same way that Peinture consumes one’s field of vision, demanding attention whether granted willingly or not, quatour evokes the violence of resistance against entropy with an energy as relentless as the process it struggles futilely against. Blocks of rhythm and sound interlock like those of paint on canvas. Swift and forceful bow strokes recall the trajectory of brush on canvas. Process subsumes narrative, and form subsumes creative entity. Through these means, quatour translates the conceptual concerns of Peinture from sight to sound. While the exhibition is closed, this program has rekindled a partnership between the Kemper Art Museum and the Music Department at Washington University. Keep an eye out for more collaborations with the Music Department. The next one will be on Monday, November 16th in support of the fall 2015 exhibition World War I: War of Images, Images of War, more details to come. The Perseid String Quartet performs at the Kemper Art Museum during the April 9th event The Eisendrath Years: Art Inspiring Music. Photo by Kemper Art Museum. I wish we could hear the compositions. We do have a recording that will hopefully be posted in the next few weeks on YouTube. Will add a link to this post when the recording is available. The recordings are now embedded in the post. Enjoy!